When you come to see Dr. Don Swearingen, you’ll not only receive comprehensive, high-quality dental care at every visit, but you’ll also enjoy a uniquely friendly and warm environment. 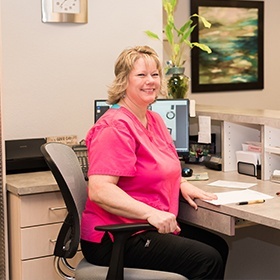 Our practice is always full of laughter and smiles because we don’t like working in a lifeless, impersonal office any more than you like visiting one! Here, every step of your experience will be designed to help maximize both your comfort and results. Basically, we’ll give you plenty of reasons to smile well beyond what we do for your teeth! Our practice is different in the best possible way because every member of our team will work to get to know you beyond your teeth, and this people-first approach will finally help take the stress out of your dental care. 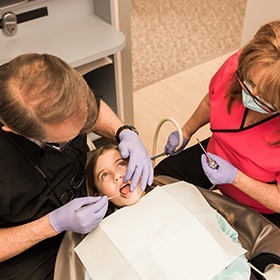 We’re happy to accept patients of all ages to our Oklahoma City practice, so whether you’re looking for a dentist for your child or yourself, you’ve found one, and we can’t wait to meet you! When dental care is done right, as in a treatment plan is formed specifically for each patient and only uses the latest techniques and technology, you get a smile that is not only healthy, beautiful, and functional, but one that will also stand the test of time. With us, we don’t just want your smile to look and feel great today, but 5, 10, and 20 years from now as well. You should never compromise when it comes to your smile, and that’s why we never will with your care. Too many patients dread their dental appointments because they are afraid of how they’ll be treated. At our practice, our goal is to change this one happy and relaxed patient at a time. 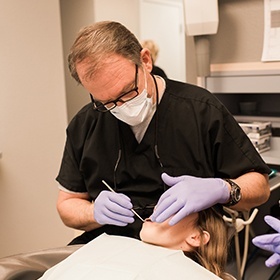 Many members of our team have worked in dentistry for over 20 years, so they along with Dr. Swearingen will know exactly how to ease your dental nerves and ensure you enjoy anxiety-free visits every single time. We’ll change the way you think about going to the dentist! Every single person is unique, and the same goes for their smile. To us, that should always be reflected in their dental care, which is why, here, nothing we provide is ever one-size-fits-all. Our treatment plans will always take into account your needs, goals, preferences, and budget so that we can consistently come up with a solution that covers all bases. You’ll be involved every step of the way so that in the end, your perfect smile is all but guaranteed.